« Older: Quick question: What would you prefer for shorter URLs? This is great if I can narrow things down with notebooks, keywords, and tags, but wouldn’t it be nice to be able to explore better? Christian Hirsch (who has been working on quite a few visual interfaces to wikis and knowledgebases) reached out to me about Mohiomap, which links up with your Evernote notebook and lets you see it as an interactive map. You can click on notes to navigate further and to see a preview in the left sidebar. You can expand items without closing the previous ones, so it’s a handy tool for exploration. I like the way that they indicate number of other entries with both a thicker line as well as a larger circle – the thicker lines are easier to follow when you’re starting from a node. The trick with new tools is to figure out how you want to fit them into your workflow. Right now, Mohiomap is a visualization and search tool. What new questions can I ask with this interface? How can I use it to learn more? Use Mohiomap to find related notes: I like the way it displays links to related notes. 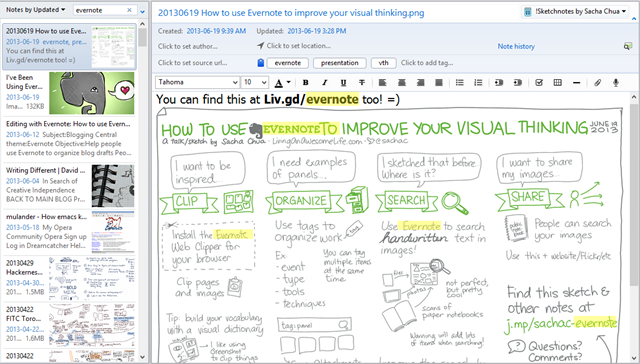 The notes are determined using the Evernote API, which seems to take the note source and tags into account. Related notes are difficult to find using the desktop application, so this might be a good way to explore when I’m writing blog posts. Use Mohiomap when searching for something that will have hits in multiple notebooks, if I want to group by notebook: Mohio’s search interface organizes the first layer of results by notebook. If I used notebooks more, then this might be a good way to browse through my search results. I tend to use tags, though. Oh well! Use Mohiomap to encourage myself to tag more, and to fix my tags. Mohiomap shows tags that are connected with each other, so that might be a way to identify overlapping tags. This is slighly less useful with a small result set (30 notes don’t have much overlap), but maybe it will become more useful later. It also lets you draw lines from notes to tags in order to add a tag to a note, and maybe this will evolve into more tagging features. It looks like the first use (browsing through related notes) might be the most relevant for me. Let’s see how well Evernote’s recommendation algorithm works! Other thoughts: Plus points for making the back button work and keeping graphs individually bookmarkable. =) I’d love to be able to add more search results, like viewing 50 or 100 at a time – or viewing a graph of the tags in my entire Evernote knowledgebase, which would be nifty. Dynamic force-directed networks can be disconcerting because of the motion. It might be great to have different views of it in addition to the current interface – maybe something more constrained like the way FreeMind or thebrain.com work? UserVoice appears to be the place for suggestions related to Mohiomap. Looking forward to seeing this grow, and any other apps that visualize your data!